A nerd goes to the dictionary to find the definition of nerd. 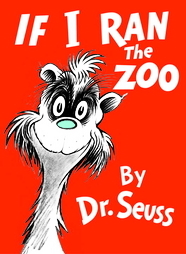 Finds that word nerd comes from Dr. Seuss (If I Ran the Zoo) and must, then, be a rare and wonderful thing. A nerd, instead of watching football, even this Sunday, would rather read a book about the history of punctuation, a book like Shady Characters: The Secret Life of Punctuation, Symbols & Other Typographical Marks, by Keith Houston. Said nerd now knows the name and history of the pilcrow, manicle and diple. Nerds are, according to the American Heritage Dictionary, “single minded” and “socially inept.” Don’t you believe it. This nerd plans to socialize on Sunday afternoon with writing friends who will not worry about half-time buffalo wings or fourth quarter fumbles or Budweiser ads (although the Clydesdales are grand) or the guilt that comes from betting on the pursuit of a misshaped hunk of leather up and down a field. Nerds are smart. ← I Write . . .
Ain’t it fun to be a nerd-giggle.